Radio Producer, Educator, Activist, Musician. Lives in Patagonia, Argentina. Since 1982 Pacho has been dedicated to radio, working in every role of a radio station from production to presenting, and all technical operations in between. Ten years ago, he started to experiment with sound. Combining his own musical creativity with this experimentation led him to develop new formats and textures, which were united over the years into groundbreaking radiophonic projects. Pacho is passionate about the Mapuce society (the original residents of the Patagonian Andes), and is a longstanding activist working for the rights of these people. His projects have been influenced by this activism, and he has recently developed music, sound experiments and radio projects that combine his passion with his acoustic creativity. Pacho’s current projects involve the production of audioart relating to the Mapuce nation and the Patagonian nature (especially birds) and these are expanding into new radio formats. He recently reunited with his long term progressive jazz band (Los Relojes de Dali) after 10 years of devoting his time to personal projects. 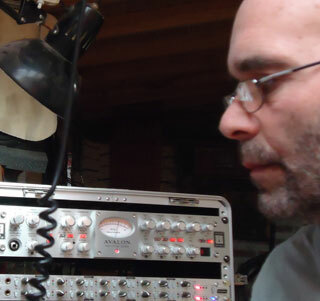 Pacho works in a home recording studio in San Martin de Los Andes, Argentina, developing his own radio and musical projects and helping others.